My greetings to you all on the fourth anniversary of UPA-2 . This is an appropriate moment to celebrate. It is also an appropriate moment to reflect on what we have sought to do during this past nine years. Our focus has never been in doubt and we have never deviated from our priorities. To strengthen our secular ethos, to address the needs of our people especially the weaker section , whether they are women or minority, schedule caste or schedule tribes or backwards. To pay special attention to farmers and workers and to strive for a growing dynamic economy that is both just and inclusive. You all are familiar with our major initiatives and there have indeed been many, as the Prime Minister has just explained to us. So can anyone question the magnitude of the changes we have been able to bring about. All states across party lines have received unprecedented assistance from our government for development programmes and schemes. Governance is now subject to strict transparency and accountability as a result of the laws that we have put in place. The weaker section of society, the dalits , adivasis, OBCs , minorities, women have been further empowered to a number of new and very effective initiatives. Never before have procurement prices for farmers being increased as they have in the last nine years. And this has led to a record production of food grains. Never before have so many of our children been in schools and colleges aspiring for better future. The nation is closely connected today through the expansion of rural roads and through mobile telephone network which is the second largest in the world with the cheapest call rates. The world is going through a financial crisis yet our government has been able to navigate these turbulent times with confidence. And has shown resilience. As the PM has said we see the making of economic recovery. 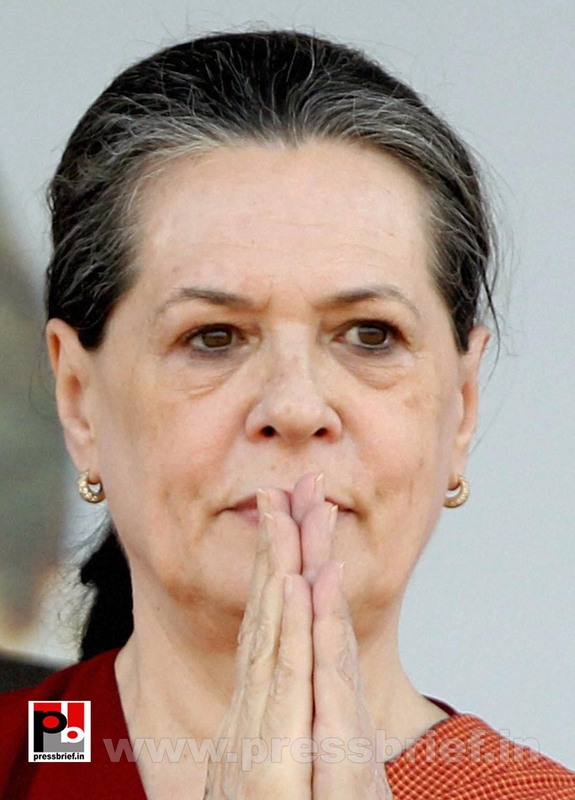 New Delhi: Congress President and UPA Chairperson Sonia Gandhi wants the new Congress government in Karnataka to address concerns of all sections, particularly Dalits and adopt a balanced approach, fiscal prudence and quick delivery on governance. This was conveyed to newly appointed Chief Minister Siddaramaiah and Karnataka Congress President G Parameshwar when they called on her in New Delhi. Sonia Gandhi told Parameshwar that the party high command was fully aware of the dalit community’s support to the Congress and that all their issues should be addressed by the new Congress government. The Congress President wanted Parameshwar and the other dalit leaders to assuage the community in this regard. Parameshwar, a senior dalit leader in the Congress party said that the Congress’ next plan was to ensure quality governance and avoid the pitfalls of the previous BJP regime. “Power, irrigation and infrastructure are our priorities. We will not tolerate corruption. The new government’s performance would be very important in this regard,” he said. Parameshwar, who is credited alongwith Siddaramaiah for the Congress’ success in Karnataka, said he had explained all the political situations in Karnataka to Sonia Gandhi. 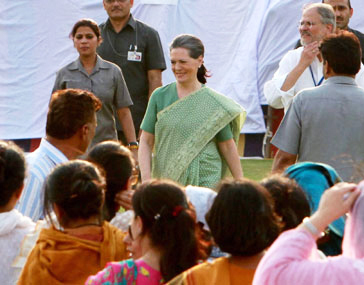 The Congress is looking at bagging at least 20 of the 28 Lok Sabha seats in the coming general polls. The Bharatiya Janata Party had won 19 seats. As for Siddaramaiah’s professed brand of social engineering that is loaded in favour of the minorities, other backward classes and dalits, Parameshwar drew attention to the fact that 29 of 44 lingayat candidates had won and 18 of 44 vokkaliga candidates were elected. “We have 47 candidates belonging to two major sections and we will address all concerns,” he said. State Congress leaders, including Siddaramaiah, are also scheduled to meet Congress vice president Rahul Gandhi. Congress President and UPA Chairperson Sonia Gandhi laid the foundation stone for a Girls' hostel at Delhi's Jamia Millia Islamia University on Tuesday. While speaking on the occassion, the Congress President said that the society and the Government should be more serious to tackle the growing violence against women. Sonia Gandhi lays foundation stone for Girl’s hostel at Jamia Millia Univ. New Delhi: Congress President and UPA Chairperson Sonia Gandhi expressed her concern over violence against women on Tuesday, while laying the foundation stone for a girl’s hostel at Delhi’s Jamia Millia Islamia University campus. She also made a strong pitch for a proactive society to create a safe environment for them. "We have been shocked by the violence that girls and women encounter on the street and even in their homes. Of course, it is not universal, but it is there widespread," said Sonia Gandhi. "It pains me that as a society, we have failed to counter it and create a safe environment where girls and women can live and flourish without being constantly forced to live in the fear of abuse and molestation," added the Congress President. While the government, Parliament and institutions like the police have to discharge their role, society at large also needs to change its mind-set, said Sonia Gandhi. "We must all become all the more proactive. There can be no better places for this other than our families, schools and universities," she added. Sonia Gandhi also expressed happiness over the decision of the university to name a ground in the university after "charismatic" cricketer late Mansoor Ali Khan Pataudi. The Congress President said she was delighted to be at the varsity as she does not often get a chance to be amongst students. Congress workers assembled at 10 Janpath, New Delhi to greet Congress President Sonia Gandhi and party Vice President Rahul Gandhi after party's massive victory in the Karnataka Assembly polls. Congress secured absolute majority in Karnataka routing the ruling BJP government winning in 121 seats. 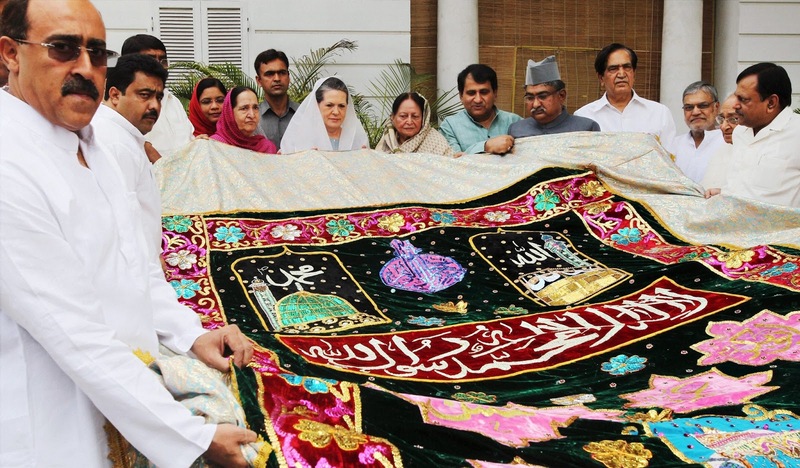 New Delhi: Congress President and UPA Chairperson Sonia Gandhi sent a "Chadar" as an offering to the Ajmer Sharif shrine on Sunday. The dargah of Khwaja Moin-ud-din Chishti is hosting the religious fair called Urs marking the 801st death anniversary of the Sufi saint that began on Friday. Millions of devotees from all parts of the world visit the saint's shrine during the Urs ceremony. Moin-ud-din Chishti is believed to have been born in 1142 AD. Since his ancestors belonged to a town named Chishti, people began calling him by that name. Chishti, who preached tolerance and unity of all religions, died in Ajmer where his tomb has become a shrine for millions of people. In 1236 AD, the saint entered his cell to pray in seclusion for six days, at the end of which he died. Since then Urs has been celebrated for six days every year. It is believed that praying at the tomb of the saint fulfils a person's wishes. New Delhi: The massive victory for the Congress clearly demonstrated the perfect leadership acumen of Congress President Sonia Gandhi supplemented by party VicePresident Rahul Gandhi. They had extensively campaigned for the state assembly polls and the results show that the Congress could win most of the seats where these two leaders had campaigned. After the landslide victory in Karnataka, the Congress correctly questioned the Gujarat chief minister's popularity outside his state and hailed the role of Rahul Gandhi as a mass leader. Prime Minister Dr Manmohan Singh also hailed Rahul Gandhi for playing a leading role in the campaign in Karnataka. "It is a clear result against the ideology of the BJP, which has been ruling in the state of Karnataka," he said. Responding to a query about the Lok Sabha elections, the PM said, "People of the country know what is what and they will reject the BJP ideology as the result in Karnataka shows." "I am very happy with the victory in Karnataka. It was a joint effort," said Congress president Sonia Gandhi. Making a departure from the common refrain about assembly elections being fought on local issues, senior Congress leaders also questioned Modi's popularity outside his domain. "No one knows Modi outside Gujarat. It has been proved again by Karnataka," said Congress general secretary Digvijaya Singh. And Union minister Kapil Sibal termed Modi a "big zero", saying that he had no impact on voters in Karnataka. Rahul Gandhi's contributions, on the other hand, came in for praise. Rahul Gandhi had put in enormous hard work in the state and he also had interacted with various sections of the people. 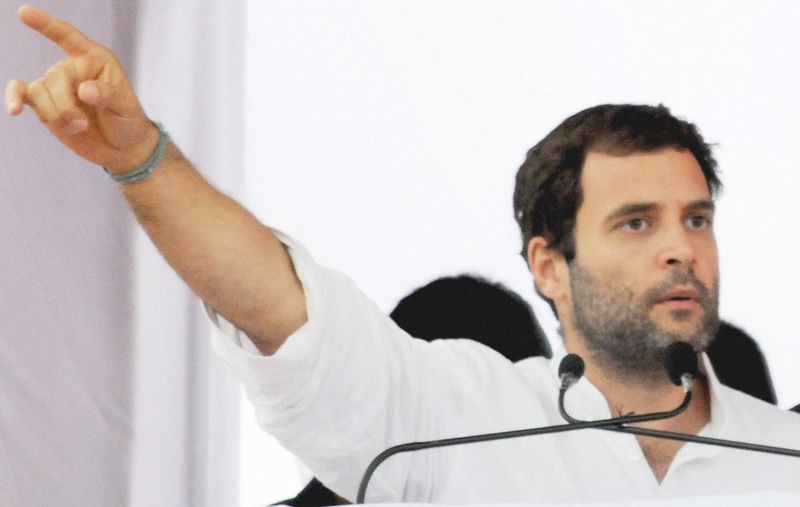 As senior Congress leader Oscar Fernandes noted, "Rahulji has been working in Karnataka for over five years." "Wherever he (Rahul) went in Karnakata, the Congress won most of those seats," says another Congress leader. The Congress did perform well in many places where Rahul Gandhi had campaigned. For instance, it swept the BJP bastion of Bagalkot. In another BJP bastion, Belgaum, the Congress performed well. The Congress made improvements or at least retained its tally from the last election in other districts visited by Rahul Gandhi—Mandya, Tumkur, Hassan. Modi, on the other hand, had a hugely successful meeting in Bangalore in terms of turnout, but the BJP's tally in the capital city, which has 28 assembly constituencies, came down from 17 in 2008 to 12 in 2013. The Congress swept the BJP stronghold of Mangalore where the Gujarat chief minister had sought to stoke Hindutva sentiment by talking about cow slaughter. Modi and Rahul Gandhi had addressed public meetings in Belgaum, too, but there also Congress crushed the BJP. Similarly Sonia Gandhi also silently, but, in a matured way supervised the election process in the state and Congress could earn good results where she had campaigned. With her effective interventions, with the help of senior Congress leaders, Congress could overcome the rebel threats also in many parts of Karnataka. This victory, will undoubtedly, act as a morale booster for the Congress and it will now look for similar results in the next General elections also. With the matured leadership of Sonia Gandhi and Rahul Gandhi, Congress hopes for yet another term for Congress-led UPA government at the Centre. Bangalore: Congress President and UPA Chairperson Sonia Gandhi addressed a big election rally at Bangalore on Thursday as part of her campaign for upcoming Karnataka assembly polls. She urged the people to vote for Congress so as to ensure a pro-poor, progressive, stable and strong government in the state. Bangalore: Congress President and UPA Chairperson Sonia Gandhi addressed a well-attended election rally at prestigious Bangalore city on Thursday as part of her campaign in Karnataka for the upcoming assembly polls. Gulbarga: Congress President and UPA Chairperson Sonia Gandhi while speaking at a mammoth poll rally in Gulbarga as part of her campaign for the May 5 assembly polls in Karnataka slammed the ruling BJP government for its misrule and corruption. "Karnataka has always been maintaining its secular culture. Karnataka is such a state where people believing in different religions, people who speak different languages live together peacefully and in harmony. Gulbarga has a long golden past but the BJP misrule has ruined this historic region. BJP indulged in spreading divisive ideology making brothers to fight each other", said Sonia Gandhi. Gulbarga: Congress President and UPA Chairperson Sonia Gandhi addressed a massive election rally in Gulbarga as part of her campaign for the upcoming May 5 assembly polls in Karnataka. She attacked the ruling BJP government for its misrule and corruption, the Congress President lamented “Karnataka has always been maintaining its secular culture. Karnataka is such a state where people believing in different religions, people who speak different languages live together peacefully and in harmony. Gulbarga has a long golden past but the BJP misrule has ruined this historic region. BJP indulged in spreading divisive ideology making brothers to fight each other”.